Park at Golden Gate Fields and Beat the Traffic! BACK FOR A SECOND YEAR! Join the Clean Team Get the Special Collector's Button! At the Berkeley Kite Festival it seems that a fresh surprise awaits around every corner. In one amphitheater you’ll find multi-line competitions of the Bay Area Sport Kite League. In another you’ll find events and other competitions, such as the candy drops and rokkaku battles. Look to the north and you will see the traditional kites of our special guests from the Sode-cho Kite-Flying Society of Hamamatsu, Japan. 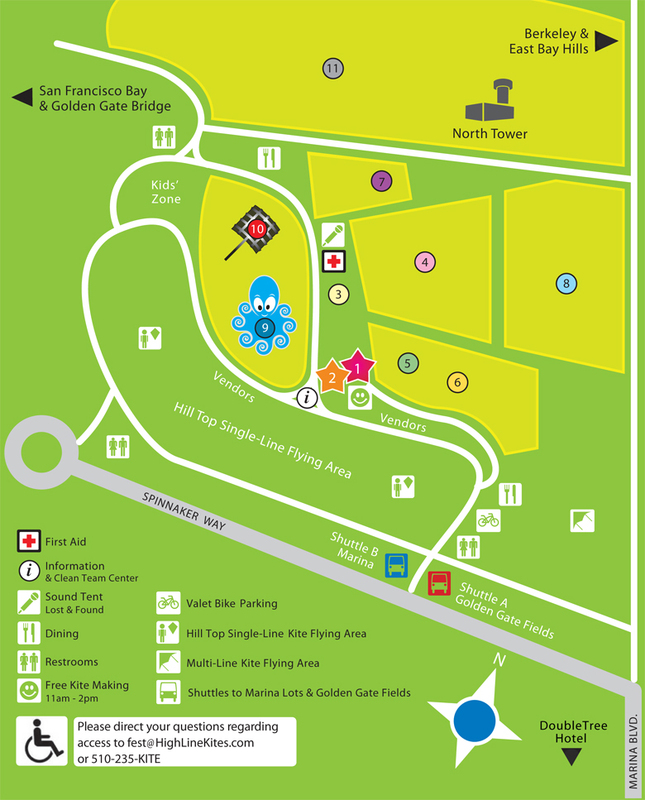 In the upper field you’ll enjoy the giant creature kite show of the Berkeley Kite Wranglers and Friends. Just down the hill from the Wrangler Field, visitors can get hands-on demonstrations of all the latest products from Ozone Kites, Revolution Kites and Prism Designs. Backing up the demo fields is the giant HighlineKites.com tent, where you can get the best kites. Behind the kite tent you’ll see hundreds of kids enjoying the free kite making and behind them, a designated area along the ridge for families and their kites. Each area of the festival will give you a different taste of what kiting has to offer. If you find that your stomach should start to growl, simply follow ridgeline west to the widest array of food offerings ever seen at the BKF. Need a full meal? How about sushi, Thai food or seafood? Just want a snack? How about corn on the cob, pretzels or our favorite, Ben & Jerry’s ice cream? Everything looks so good, you’ll wish you could have one of each!